On Saturday, January 30th, I visited House Spirits Distillery, the southernmost of the five establishments comprising Portland's "Distillery Row". House Spirits originated as an post-inception partner of Ransom. 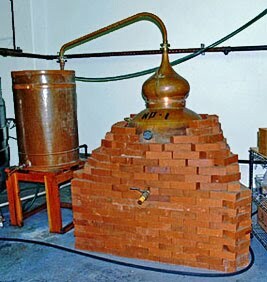 The distillery was originally right here in Corvallis, operating out of rented space on the backside of the building located at 1025 NW 9th street (the same building that houses Taylor Street Ovens). At the end of 2004 they relocated to the present location in Portland; in 2008, Ransom relocated its distilling operation to Ransom Winery in Sheridan. The original still, an old-fashioned copper alembic type, still resides at the House Spirits distillery. It's not used much anymore, having been replaced by a shiny new stainless steel unit of much greater capacity and flexibility. I suspect it's kept around mostly for sentimental reasons. Plus it's quaint, just like Corvallis. I was given a tour of the facility by Matt Mount, one of the distillers. Matt, a former bartender, is quite knowledgeable about spirits in general, and provided a great deal of information of the distillery's operation and the processes associated with each of its products. After the tour, I was able to sample most of these. The vodka is, well, a vodka. Any vodka that manages to avoid smelling like medicinal alcohol is a good one, and the Medoyeff succeeds in that. However, so does Gordon's, and it costs $7.45. The Medoyeff is made from rye, and I think I detected a bit of that on the nose, but if you are looking for a good rye presence, Sobieski does a better job of that and it costs $12.45. The Meydoyeff is also quite smooth, with a bit of minerality to it, but Stolichnaya Gold is better in both respects and even at $24.95 still offers a price advantage. If anyone feels I'm being unfair to the Medoyeff, you should understand that I consider high price vodkas to be something of a scam. The stuff costs very little to make, and the marketing is really directed at creating a certain image for the product (and the price is part of that). I mean, let's face it; once mixed into a drink, the subtle differences between vodkas disappear. The only people who drink it straight are Russians and college students, and they don't keep it in their mouths long enough to taste it. I've been told about a high end bar (in another state) the owner of which tops off his bottles of Grey Goose with Smirnoff. His well-heeled customers are utterly clueless, convinced that the GG they think they are getting is the best vodka in the world. Moving on to the Aviation Gin, I found this to be quite smooth, with just a hint of juniper. For me, the most noticeable botanical was anise, but there are others in the background. It's not that different from a oude genever such as Bols, which are at least 15% lower proof spirit distilled from malted barley. Taken straight, an oude genever is going to be smoother than the Aviation, but in a mixed drink that won't likely make much difference, and the Aviation offers a $20 price advantage over Bols. Next was the Krogstad Aquavit. This type of spirit is Scandinavian in origin, essentially a gin but flavored with star anise and caraway seed (no juniper). I've had a couple from Denmark, and the House Spirit product is easily their peer. Very smooth, with strong anise aromas and flavor, it would make a good on-the-rocks drink for a warm afternoon on the patio. The Straight Malt Whiskey is similar to that made by a handful of Scottish distilleries that don't peat their barley malt (Auchentoshan, Glenkinchie, Glengoyne). Unlike those, the House Spirit whiskey is aged in new, charred American oak barrels (the Scots age their malts in ex-bourbon and/or ex-sherry barrels). The current bottling spent two years and eight months in these barrels. It's a nice copper color, with aromas of malt, caramel and a hint of orange. It's a little rough on the palate, with only the barest hint of oak. Finish is short, with some burn. I can't help but feel it would be a lot better with a little more barrel time (say, a total of four years). For my money, a bottle of Glengoyne 10 year old ($46.95) is a better deal. I also had the opportunity to try a number of experimental spirits, plus some releases that are already sold out. One of the former was an aged aquavit (one year in an barrel that previously held Pinot Noir). This was very interesting; extremely smooth, with the anise actually stronger than the unaged version. Next I tried the rum, which was released last September and is already all sold (except for a small amount still at the distillery). It's unusual in that it's made from refined sugar (most rums are made from molasses or cane juice). The only other one I know of that's made from sugar is Charbay from California. The House Spirit rum was aged 14 months in new, charred American oak. It was nice, smooth with a brown sugar thing going on, but not particularly complex. Matt informed me that the next rum will spend two years in second hand bourbon barrels; I'm hoping to try some of that. All in all, I was impressed with the operation. This is an outfit clearly dedicated to producing quality products. I'm hoping that with time and an improved financial situation, they'll be able to give their whiskey more time in the barrel. I believe an eight year old version of it would be superb.